Over fifty years of leading lives of passion and purpose. Take Route 101 to I-93 North. Follow I-93 to Manchester Exit 9N. At the first traffic light (Bank of America) turn left onto West Alice Avenue, which makes a sharp left turn and ends at a stop sign. Turn right onto Bicentennial Drive and go to the bottom of the hill to the stop sign. You are facing The Derryfield School campus. To go to the main entrance, turn left and the entrance will be on the right. To go directly to the Admission Office, go straight at the stop sign across River Road into our Middle School entrance. Part way down the hill, turn left into the large lot next to the Gateway Building. On the left, you will see four reserved spots for Admission. Take the staircase on your left, which leads to the front of the Gateway Building and directly into our Admission reception area. Take Interstate-93 to Manchester Exit 9N. At the first traffic light (Bank of America) turn left onto West Alice Avenue, which makes a sharp left turn and ends at a stop sign. Turn right onto Bicentennial Drive and go to the bottom of the hill to the stop sign. You are facing The Derryfield School campus. To go to the main entrance, turn left and the entrance will be on the right. To go directly to the Admission Office, go straight at the stop sign across River Road into our Middle School entrance. Part way down the hill, turn left into the large lot next to the Gateway Building. On the left, you will see four reserved spots for Admission. Take the staircase on your left, which leads to the front of the Gateway Building and directly into our Admission reception area. (Bedford, Amherst, Nashua, Hollis): Take I-293 North along the Merrimack River past downtown Manchester. Take Exit 6, Amoskeag Bridge. Follow your first right off of the rotary. Move into the left lane and stay left over the river to the light at Elm Street. Turn left on Elm, and left again at the next light onto Webster Street. Turn right onto River Road. Follow approximately two miles to Derryfield's main campus. (Note: Continue straight at the stop sign where Union Street intersects with River Road.) The main entrance will be on the left. To go directly to the Admission Office, go approximately 200 yards past the main entrance and turn left into the Middle School entrance. Part way down the hill, turn left into the large lot next to the Gateway Building. On the left, you will see four reserved spots for Admission. Take the staircase on your left, which leads to the front of the Gateway Building and directly into our Admission reception area. 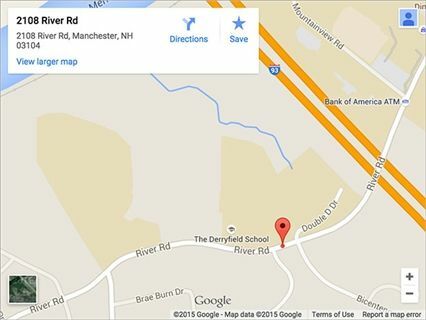 When visiting the admission office, please use the street address of 2226 River Road, Manchester to bring you directly to the Gateway Building. Located in Manchester, NH, The Derryfield School is a private day school for grades 6-12. Students benefit from a challenging academic program, fine and performing arts, competitive athletics, and a wide selection of extracurricular activities.